1. What is the Insulin Resistance Syndrome (IRS)? The Insulin Resistance Syndrome describes a condition that is characterized by decreased tissue sensitivity to the action of insulin, leading to a compensatory increase in insulin secretion. This metabolic dysfunction leads to a cluster of abnormalities with serious clinical consequences, most importantly, cardiovascular disease and/or type 2 diabetes. 2. What is the clinical impact of the Insulin Resistance Syndrome? 3. Who is more likely to have the Insulin Resistance Syndrome? The more factors an individual has, the greater the likelihood of having the Insulin Resistance Syndrome. Porcine (pig) insulin has only a single amino acid variation from the human variety; bovine (beef) insulin varies by three amino acids. Both are active on the human receptor and have roughly the same potency when used in humans. Animal insulins cause more allergic reactions to people than human insulin, but agents added to synthetic insulin may still produce allergic reaction in some people. Before human recombinant analogues were available, porcine insulin was chemically converted into the same structure of human insulin. Chemical modifications of amino acid side chains, and the N-terminus and C-terminus to alter the ADME characteristics of the analogue were used. Novo Nordisk was able to enzymatically convert porcine insulin into human insulin by removing the single amino acid that varies from the human variety, and chemically adding the correct one. Unmodified human and porcine insulin tend to form hexamers in contact with zinc in the bloodstream. Insulin in the form of a hexamer will not bind to its receptors, so the hexamer has to slowly equilibrate back into its monomers to be biologically useful. Hexameric insulin is not readily available for the body when insulin is needed in large does, such as after a meal. Zinc combinations of insulin are used for slow release of basal insulin. 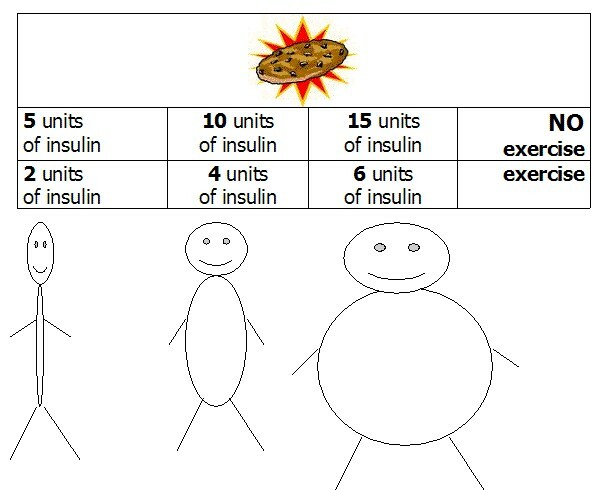 (Basal insulin is the amount the body needs for basic metabolic function). Non-hexameric insulins were developed to be faster acting and replace the injection of normal unmodified insulin that comes after a meal. Novo Nordisk manufactures insulin aspart (marketed as Novolog®; a rapid-acting insulin analogue). Insulin aspart is manufactured through recombinant DNA technology so that the amino acid, B28, which is normally proline, is substituted with an aspartic acid residue. The sequence is then inserted into yeast genome, and the yeast express the insulin analogue, which is then harvested from a bioreactor. This analogue also prevents the formation of hexamers to create a faster acting insulin. Lilly manufactured the first insulin analogue, lispro, a rapid-acting insulin analogue (sold under the trade name Humalog®). Lispro insulin is engineered through recombinant DNA technology so that the penultimate lysine and proline residues on the C-terminal end of the B-chain are reversed. This modification does not alter receptor binding, but blocks the formation of insulin dimers and hexamers. This allows larger amounts of active monomeric insulin to be available for postprandial (after meal) injections. Normal, unmodified insulin is soluble at physiological pH. New analogues shift the isoelectric point so that it exists in a solubility equilibrium in which most is precipitated (the insulin separates from the solution) in the bloodstream. More becomes soluble and the small amount dissolved in the bloodstream is excreted by the kidney. These insulin analogues are used to replace the basal level of insulin, and are effective over a period of 24 hours (i.e. Lantus, also called the "poor man's pump, see "Glargine insulin" below). Aventis developed glargine as a longer lasting insulin analogue, and markets it under the trade name Lantus®. It was created by modifying three amino acids. Two positively charged arginine molecules were added to the C-terminus of the B-chain, and they shift the isoelectric point from a pH of 5.4 to 6.7, making glargine more soluble at a slightly acidic pH and less soluble at a physiological pH. Replacing the acid-sensitive asparagine at position 21 in the A-chain by glycine is needed to avoid deamination and dimerization of the arginine residue. This simply means that insulin separates from the solution under more ideal circumstances in the body and has a longer acting period. These three structural changes and formulation with zinc result in a prolonged action when compared with regular human insulin. When the pH 4.0 solution is injected, most of the material precipitates and is not bioavailable. A small amount is immediately available for use, and the remainder is sequestered in the bloodstream. As the glargine is used, small amounts of the precipitated material will move into solution in the bloodstream, and the basal level of insulin will be maintained over a 24 hour period. The onset of action of subcutaneous (injected under the skin) insulin glargine is slower than NPH human insulin but acts over a longer period of time. Glargine insulin cannot be mixed with other insulin types and it is often used to treat gestational diabetes. Novo Nordisk created "detemir" and will market it under the trade name Levemir® as a longer lasting insulin analogue for maintaining the basal level of insulin. It's potency is only about 80% that of other insulins so a person may require a larger dose on detemir. Inhaled insulin is comprised of 20% insulin molecules and 80% unknown molecules (will not reveal the makeup of its compound). However, it is likely that remaining molecules are some sort of protein that will not trigger an autoimmune response by the body. Currently, only Regular insulin can be delivered via inhalation and so it is still necessary to inject long-acting insulin. The inhaled insulin delivery system provides insulin as a spray or a dry powder inhaled through the mouth directly into the lungs where it passes into the bloodstream. Researchers also are investigating systems for delivering insulin intranasally (as a nose spray). Although serious side effects have not occurred during studies, more research is needed to examine the long-term safety of both inhaled and intranasal insulin treatments, especially for pediatric use. Inhaled insulin received FDA approval in January of 2006. Inhaled insulin works similar to an asthma inhaler (but the delivery device is much bigger). It is a dry powered form of insulin that passes into the blood stream when inhaled into the lungs. Because only 8-12% of the insulin can be absorbed this way, you need to take more and that increases the cost (it is currently a very expensive method of delivery that may not be covered by insurance). 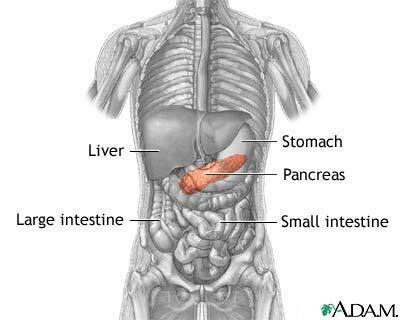 In people who do not have diabetes, glucose in the blood stimulates production of insulin in the beta cells. Beta cells "measure" blood glucose levels constantly and deliver the required amount of insulin to funnel glucose into cells. They keep blood sugar in the normal range of 60 mg to 120 mg.